Professional elliptical trainer, quiet running, high quality sturdy structure, high weight limit, 19 programs, 2 trays for your personal items. 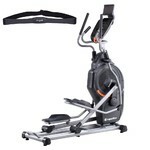 The Elliptical Trainer inSPORTline Gemini E200 is an elegant elliptical trainer suitable for commercial use. The fully electric operation and sturdy structure not only save energy but also eliminate cables. The Gemini E200 features a clear display and a computer with 12 preset programs with different resistance levels, user programs, a HRC program (works based on the preset hear rate) and a WATT program. As the numbers and letter are large and thus easy to read, the computer is user friendly. This elliptical trainer also features a USB input which allows you to charge your phone, and speakers which allow you to listen to music. The display frame features a tablet/phone/magazine holder and two trays, providing a high level of comfort. You may also appreciate the Pause function which allows you to stop the exercise and then pick up where you left off without losing your data. 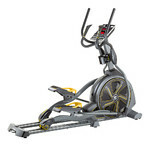 The structure of the Elliptical Trainer inSPORTline Gemini E200 is unique. The massive frame with the 140kg weight limit (permanent load), 51cm stride length, 24cm pedal spacing and ergonomic shape make the exercise as comfortable and effective as possible. The mobile handles feature built-in heart rate monitors and control panels. The transportation wheels, bottle holder and uneven surface adjustment system are a must. The large, anti-slip footboards provide safety. 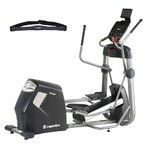 All of the above makes the Elliptical Trainer inSPORTline Gemini E200 perfect for commercial, club and home use.